Jack Lester was delighted with the outstanding football in the first half and the maturity in the second as his Chesterfield side upset the odds to beat Luton 2-0. It was a comfortable victory and the Spireites, winless in six prior to the Proact encounter, were rarely troubled by the league leaders who have scored 13 more goals than anyone else in League Two. Lester was purring after the match. Joe Rowley put Town ahead on 19 minutes before Jak McCourt’s penalty made it 2-0 six minutes later. “Some of the football first half was outstanding, the performance was really good, the energy levels were higher than the opposition in the first half,” he said. “We outran them, outfought them and played some really good football. “The first goal was the best bit of quality in the match, that was right out of the top drawer. “The movement, the energy, the purposeful passing. “It was a really mature second half as well. Getting at Luton early on was a big part of the Spireites’ game plan because Lester wanted to bring the home supporters into play. “It was key. We spoke about really taking the game to them, being on the front foot and using the fans to our advantage. “There was a lot of movement ahead of the football, a lot of people running beyond and the switches of play were really good. “We had players popping up all over the place and that’s really difficult to play against. Lester lauded his back four for being competitive and aggressive and said on loan goalkeeper Aaron Ramsdale, who made a number of good saves, showed why he’s expected to go on to big things. “He’s going to be a top keeper. I think you could see that. “We spoke in the week about a chance to get resilient, when you have tough times they’re the times to grow. “He’s taken it on board, knuckled down this week and you can see he’s going to be a top keeper. 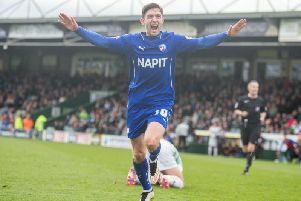 Chesterfield were without the services of top goalscorer Kristian Dennis and Lester explained that they were being cautious over a calf niggle. According to the boss the striker’s absence from the squad was nothing to do with the transfer window. “Definitely not, he’s not that lad, he wants to do well and he’s behind the club, he’s a great lad. “He felt it on Tuesday and went straight for a scan. The manager has another full week to work with his men before a trip to the side directly above them in the table, Yeovil. That time on the training ground will allow his new signings to get up to speed, and others may soon join them. “The squad has been really stretched, we’ve had to get people to play 90 back to back to back, when really you’d like to rotate,” he said. “We’re working hard to bring in some tough characters to bring up the group and we’ve got some tough characters here who will remain here. “It’s all about progression and we’re trying hard to do that. “I think it’s great that it’s Saturday, Saturday, Saturday. “We have to mould this team together. There might be one or two more coming in. “We want to really push that level again.